Are You Listening? Listening doesn't always happen with the ears. 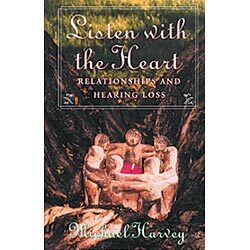 In this book of true stories, Dr. Michael Harvey shares the personal and sometimes overwhelming struggles of people with hearing loss and the challenges this presents to their relationships. Many search endlessly for answers to the questions Why me? and What do I do now? In stories from the author's psychotherapy practice with individuals, couples, and families, we are moved to witness their sojourn of self-discovery. Beneficial to a wide audience including spouses, children, parents, friends, extended family members, and professionals, this book is also an excellent text for college and graduate level courses in psychology, mental health counseling, speech and hearing, special education, and Deaf education. Do you know someone who is struggling with hearing loss? Then, are you listening? But more importantly are you listening with the heart? 198 pages.